As a child, Simon Jackson found navigating the world of the school playground difficult. He felt most at home in the woodlands, learning about and photographing wildlife. As a teenager, he became fascinated with spirit bears, a rare subspecies of black bear with creamy white fur. These elusive creatures were losing their habitat to deforestation, and Simon knew he had to do something to protect them. He decided he would become the voice for the spirit bears. But first, he would have to find his own. Carmen Oliver's inspiring true story is based on the early life of Simon Jackson, who founded the Spirit Bear Youth Coalition. On his remarkable journey to protect the spirit bears, he met Dr. Jane Goodall and eventually hiked the Great Bear Rainforest --- the home of these elusive animals. Katy Dockrill's captivating art adds depth and beauty to the story. 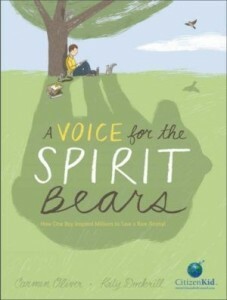 Photos and additional details about Simon Jackson's life and about spirit bears are included in the end matter. Part of the CitizenKid collection, this book demonstrates how one child can be a voice for change. Simon's story is an excellent example of growth mindset at work, highlighting personal growth and overcoming obstacles through activism.